I am building a false wall. I am planning to mount an acoustically transparent fixed screen. 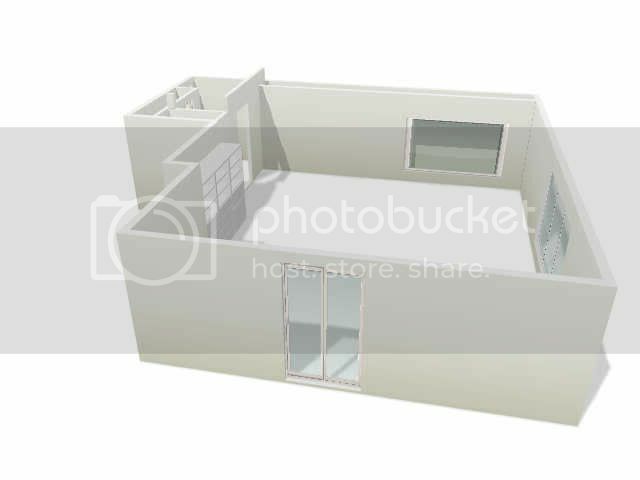 I am planning to build a recessed area behind the screen to accomodate/conceal the FL, C and FR. The recessed area will be 22" deep (called axiom and got the specs of the M60 and was told I needed to place the speakers 4 inches from the wall, that is how I planned the depth). Here is a pic of the plan. On AVSForum a person made a statement about needing a minimum of 3' from either side of a tower speaker. When I talked with axiom I was told a minimum of 6ft between the FL and FR at a seating distance of 12 feet. The person I talked to was told of the plan and did not mention any concern other than the distance between the FL and FR. Can I use the M60 speakers to accomplish my plan? I'm not a fan of installing any speakers into "recessed" areas because of the adjacent boundary effects that will possibly degrade sound quality. It's a bit unclear from your question and the illustration just how recessed the speakers will be. The crossover and frequency response (as well as the porting) of the in-cabinet M60 is adjusted to compensate for recessing the speaker. Otherwise, tower speakers (and all speakers) are designed to perform at their best in free space, not tucked into cubby-holes and the like. This was going to be a shelf like recessed area that is 22 inches deep. The actual front of the speakers could be exposed (within reason) any amount I want depending how I mount my screen. I could build out the projection screen say 3 inches then the speaker could be exposed 3inches (just an example). All's that would be in front of the drivers would be the AT screen. My screen is most likely going to be 51" high X 120" wide. So that could be my recessed area if needed. So the measurement of the recessed area could be 51" H X 120" W X 22" deep. The wall is not complete, I am in the process to see if I can maintain the power of a tower speaker yet still not take up floor space by the tower. If this is not a good plan then it can be reversed I just don't want to. If it is better to purchase the linked speaker, what is you advice for a matching center? No matter which way you go speaker wise, the best match for a center will be the same as your L&R channels. So 3 M60's across the front as your L C R in whichever design format you choose is best. I wish I had the space to something like that! Space is nice but the more space the more $$$ for speakers etc. This should be a great setup once I can finalize where everything goes and build it all. If you can expose the front of the M60s and have them protruding out from the recessed space, that will be fine. Even better if they don't fire through the acoustically transparent screen. The latter are never totally transparent and do compromise sound quality, but for movies, the compromise may not be all that critical. You should also realize that the perforations in acoustically transparent screens reduce the brightness of the projected image by as much as 20%, according to projection video guru Joe Kane. As to separation between the speakers, I tend to err on the side of caution. It's not cast in stone, and you can separate them by as much as the same distance as your viewing distance. I tend to suggest "6 to 10 feet", unless you're in a huge room sitting a long way back. It's worth experimenting before you commit to set positions in a given room. As Dr. Floyd Toole points out, "the room is the forgotten component." When talking about separation of speakers, does this include the center channel also?? So if I had a 120" opening if I needed 6 ft between all three, that means I need 12 ft of space or does this measurement apply to the FL and FR. If I wanted to go with a M60 for the FL and FR can I integrate the VP150 with those two?? Is the VP 150 a match. the though is to have say 7ft between the FL and FR and the VP150 between the two. You should also realize that the perforations in acoustically transparent screens reduce the brightness of the projected image by as much as 20%, according to projection video guru Joe Kane. I have read this also and am considering the options available. This is going to be a DIY AT fixed screen. Behind the screen I am going to paint the recessed area black. the cloth will most likely be SeymourAV (which has good reviews, even considering loss in brightness. The VP150 will match but since you have the space that very few have in order to accommodate a vertical center, I would seriously consider extending the budget a bit and get a 3rd M60 for a center as Dan pointed out, That will give you a truly amazing front soundstage. Like many on this forum, I used to have a VP150 with my M80s and I wouldn't say it was a bad speaker but it just couldn't keep up with the M80s, it was OK for movies but found that it was lacking for music. That's why I switched to the VP180. If I would have had the space I would have gone with a 3rd M80. Bill, when "separation" of speakers at the front is discussed, it refers to the L/R speakers and not the center, if any. A good standard is to have the speakers separated by about as much as your distance from them; so for your 12' listening distance you should use all of the 10' width available to you.